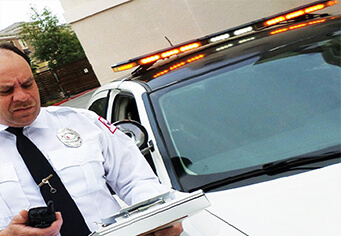 CitiTrac's hand-held mobile device optimizes the vital ability for Citiguard Officers to monitor, receive, and respond immediately to security issues. CitiTrac's astute technology provides Citiguard's Security personnel the ability to report the exact details of a security issue within moments. All reported issues are time stamped and assigned automatic tracking numbers. CitiTrac capabilities include time-stamped photographs and audio files that are automatically attached to the report issue. The CitiTrac system provides for the receipt of tasks and alerts from Citiguard management or the client, the viewing of post orders, the ability to scan checkpoints, and the opportunity to view security services performance. Because we believe in total transperency, CitiTrac is provided at no charge to our clients. The CitiTrac will hold all security guards accountable for their patrols during their shift. When the Field Supervisor randomly visits the site, he/she will then download the data the CitiTrac has gathered, the field supervisor will instantly know if the security officer is following the post orders and is patrolling the premises frequently. All the information stored in the CitiTrac system is available to the client at their request.